Pictured left to right: Kevin Brown (Beaches Watch Interim Vice President and Fletcher teacher), Phuc Pham (scholarship recipient), and Sandy Golding (Beaches Watch Board of Directors). 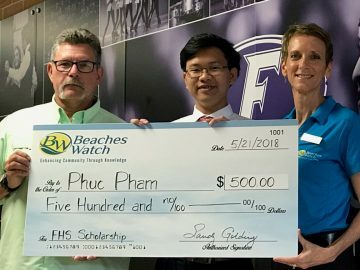 On Monday, May 21, 2018, Beaches Watch presented our second annual Beaches Watch scholarship to a deserving Fletcher High School student who shares in our mission to preserve and improve the wonderful quality of life of our special beaches communities. Phuc Pham was selected for his essay discussing what he believes is necessary to improve the quality of life at the beaches. Phuc is graduating 26th in his senior class and he will be attending the University of Florida where he will be studying biomedical engineering. We are pleased to give Phuc a $500.00 scholarship, thanks to the generous support of the Beaches Watch membership! Having only lived in the beaches community for 4 years, I have realized that there is actually a social connection to define the beaches community. Everyone looks out for each other and makes an active effort to make sure the beaches are healthy and clean. My experience with the beaches community is thanks to the Marine Coastal Club at the Duncan U. Fletcher High School and Mr. Brown- who holds the beaches so dear to his heart and actively works to fight for the protection of the beaches, in the face of hurricanes and pesky teens. Because of them, I was offered the opportunities to take part in the effort to improve the quality of life in the beaches community. This included the St. John River and Beach clean-ups held by the club and the exposure to the need for management and protection through the education provided by Mr. Brown’s classes. As a result I believe that in order to improve the quality of life within the beaches community, the people of the beach in to be educated and exposed the same way I have to the importance of the beaches and the cooperative efforts to keep it clean and functional. The People need to be informed how this is possible and the opportunities presented to them to do so, whether it’s through social media or signs posted along the beaches and streets. In the wake of Hurricane Irma, the sand dunes and sea oats built up years and years of recreation and work has been demolished. Sand dunes are vitally important in the beaches community. The dunes and the sea oats that inhabit the dunes, are responsible for absorbing wave action during high tide and potential flooding that tropical storms and hurricanes can bring to the coast of Jacksonville. As a result, these dunes and its vegetation should be preserved and managed as much as possible. Being a part of the 3700 sea oats that the Marine Coastal Club and Mr. Brown, has planted was an eye opener. Not only was the damage realized to me, but also the importance of these projects to restore the beaches back to its original state in the face of adversity. While the community and the people of the beaches can play a large role in improving the quality of life within the beaches, I believe that the government and legislation should also back the passion that is instilled in the community. Legislation such as Jacksonville’s “zero tolerance” littering policy is very rigid. There is virtually no way to catch every offender. As state by Councilwoman Katrina Brown, there is a massive problem with littering and illegal trash dumping in not only the beaches, but the beaches area in general and there is no way to catch the offenders. Katrina stated that the solution of surveillance cameras by the JSO has resulted in nothing. In order to resolve this issue, the council and the government surrounding the beaches community need to realize the importance of this issue and take initiative in the matter. The fines and legislation concerning littering need to be further emphasized and enforced, through an increase in frequency in signs and warnings; while better and more cameras need to be supplied to catch those that violate the law. While my time in the beaches community is short-lived as I will soon move onto college, what I experienced here cannot be replaced. The beaches community is the embodiment of passion and dedication that I could not have found anywhere else and I wish for it to remain this way. In order for this to happen, people and positions of power need to step up alike and protect what has brought them up to who they are in the first place.